You’ve mentioned that you used to be a self-proclaimed auto airhead, what first peeked your interest in the automotive industry? Patrice: I was a typical woman who owned car but didn’t feel in control of it. I didn’t know anything about maintenance and service, I felt taken advantage of and anytime something would happen I would panic. At one point, I was in search of a female mechanic to help me, and to my surprise I could not find one. I wondered how come there wasn’t any type of support group out there. 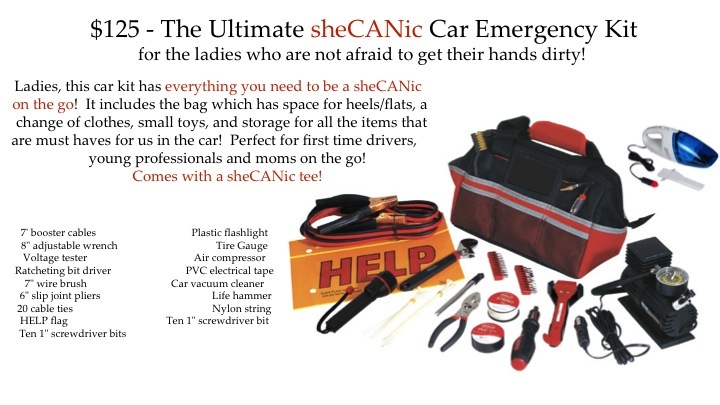 I decided to start my own company to empower women and help them get the knowledge that they need about their vehicles so they don’t fear their car or the mechanic. At what moment did you know it was time to leave your full-time job at DuPont, and how did you know this was what you were purposed to do? Patrice: My purpose has been to help women and empower women; that is what drives me. Girls Auto Clinic launched in 2013 and I was conducting workshops and working part-time at an auto shop while working for DuPont. When I left DuPont, I started working full-time at a shop. What made me quit my job was I was always thinking of Girls Auto Clinic, even at work. That’s when I knew it was time to go. I’m happier now; it was definitely the best decision that I made. What are some of the things you cover at your monthly maintenance workshops? Patrice: At the workshops, I cover the most important things that you need to know so that you can take better care of your car. I start with a table of used parts and unused parts. You should see the difference between when something is in good condition and when it needs to be replaced. I want women to not be afraid to ask the mechanic to show them what they are talking about. During the workshops, you have the opportunity to learn on your own car. I am going to educate you on what’s underneath your hood, what you can and cannot touch, how to jumpstart a vehicle, as well as the purpose of your battery and your engine. I make it relatable so you know and understand what is going on. What are the top 3 things everyone should know about their vehicle? 3. Know the maintenance schedule. You can refer to your owner’s manual for this information. What have you found to be the common mistake when it comes to auto maintenance? Patrice: People frequently neglect oil changes. You should change your oil regularly, and do it before the maximum amount of miles. How can women be more empowered or more informed when they visit the dealer or auto repair shop? Patrice: It’s all about education and research. My advice is to educate yourself, which you can do by reading your owner’s manual. Make sure you know the maintenance section and understand what is needed for your car. You can also purchase my Glove Box Guide. What would you say are some key indicators to let you know when a mechanic trying to pull a fast one on you? Patrice: A mechanic who doesn’t want to explain anything or is giving you a hard time. What has been your most memorable experience since starting Girls Auto Clinic? Patrice: Definitely being in the Philadelphia Daily News. It was very nostalgic for me because my mother would go to the coffee shop everyday and bring home the daily news. It was always something I looked at and read as a little girl. What is your ultimate vision for Girls Auto Clinic? Patrice: My vision is for Girls Auto Clinic to be a household name. I want to offer women automotive services that are based on trust, inclusion and empowerment. I call my company a female empowerment company. My goal is to change how women view the automotive industry, how the automotive industry views women, and the history of women in automotive. I want to open shops that cater to women and hire female mechanics and provide support and resources for their career development. There is also a lot of outreach to young girls; being proactive with them with not only their car maintenance, but also building a career in the automotive industry. Patrice: I feel empowered when I feel confident to be myself and not worry about what other people are going to think of me. Patrice: When people think of Patrice Banks, I want them to know that I’m just a girl who was a dreamer. I want to be honored for the fact that I had a dream for what I wanted for my life and I went after it. In regards to Girls Auto Clinic, I want to make history for women in the automotive industry. WANT TO MAKE HISTORY WITH GIRLS AUTO CLINIC? Full maintenance and repair services of all vehicle makes and models. Car wash/Car detail services will also be available. ● Female technicians/mechanics and service advisors. ● Sale of GAC apparel and the GAC glove box guide. ● FREE monthly workshops to educated women on car care and maintenance. ● A lounge catered to a woman’s aesthetic; comfortable, visually pleasing and clean. ● Nail salon on site that will offer nail and spa salon services.